We go to a lot of birthday parties these days between the two boys and all of their classmates. 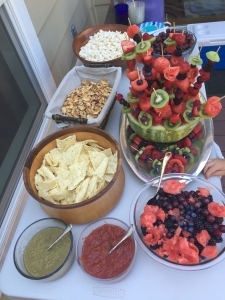 Most of the parties have at least some snacks that the boys can eat but I also have made a habit of bringing along a snack back of our own to add to the choices at the party. I used to worry about the boys feeling left out or different because they do not eat the cake and some of the other food at parties. So far that has not been the case. It might be because I bring along their favorite treats like dates, dried persimmons and berries. 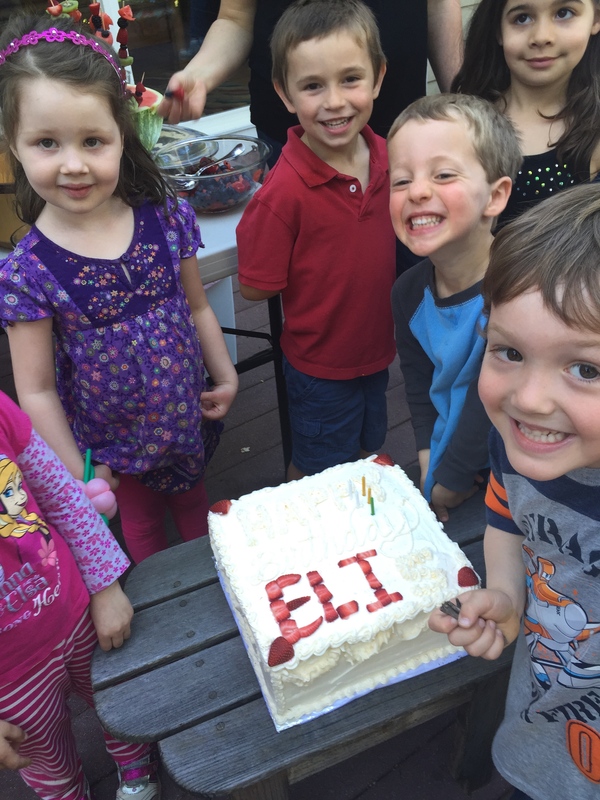 Eli turned 5 a couple of weeks ago and we had a party at our house with all of his classmates. It was fun to have a party with all vegan snacks to share with his friends. I thought I would share what we did since I get a lot of questions about what my kids can eat at parties. 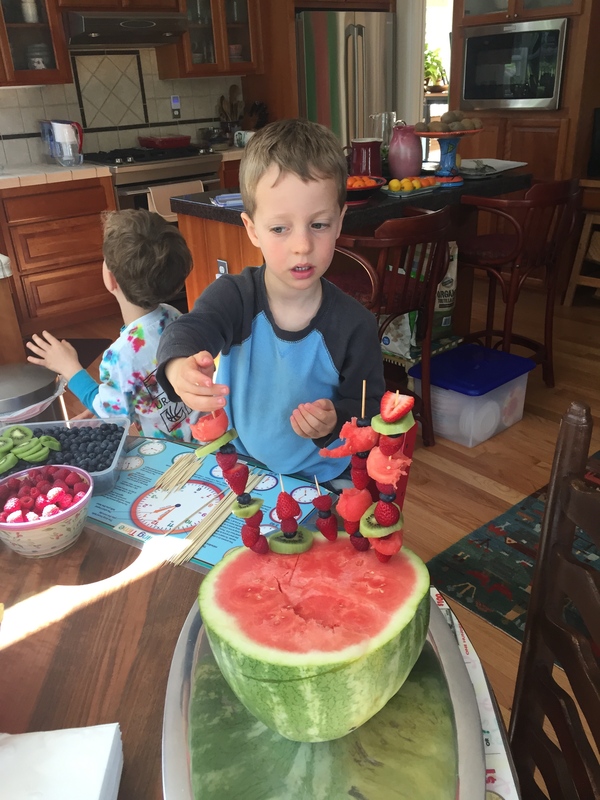 The boys love making fruit kebobs so I put them to work about an hour before the party. I wash berries and cut up fruit ahead of time. The fruit always varies between blueberries, strawberries, raspberries, kiwis, watermelon, pineapple, banana and pineapple. 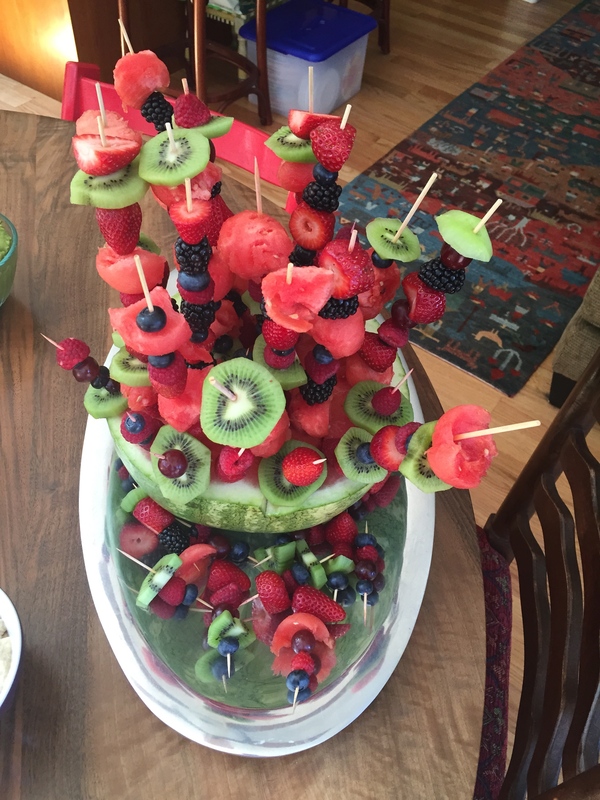 The boys made the entire fruit kebob centerpiece all by themselves. 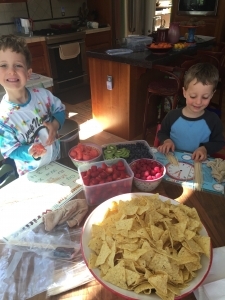 It was a great way to keep them busy while I was setting up the last minute snacks and drinks. They each get a stack of large and small wooden skewers and I put all of the fruit in between them. 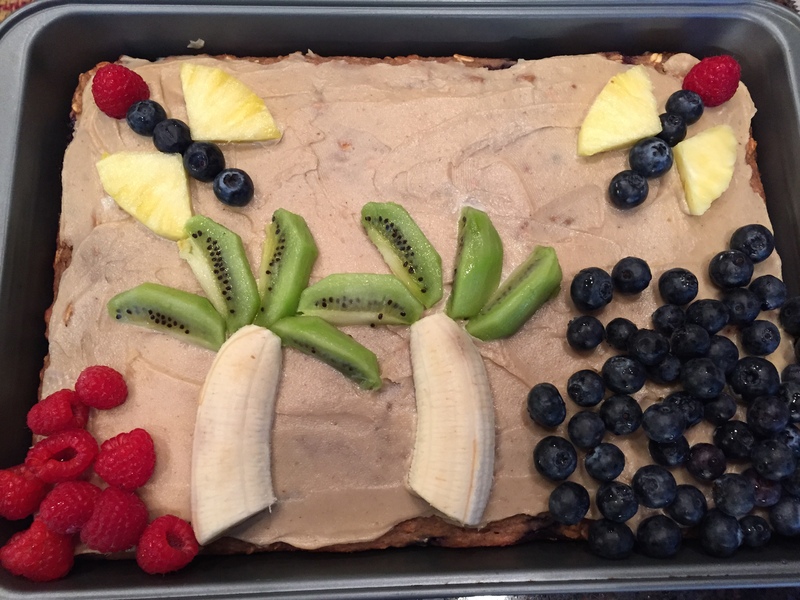 The only advice I give them is to try to make different patterns with the fruit. When they complete a kebob they then get to poke it into a watermelon that has been cut in half. The object is to fill the watermelon until there is no more space for another kebob. While the boys were busy with their project I set out the corn chips, salsa, guacamole, edamame, hummus, popcorn and drinks. It looked beautiful! This year I ordered a vegan cake from a lovely vegan tea house in Sebastopol. The baker did a fantastic job. The only problem was that my kids are not used to eating products with refined flour and sugar. They had a couple of bites and gave it back saying it was too much. I have learned my lesson and will now just bake the blueberry oatmeal banana cakes (I will post recipe soon) with no sugar or flour. It will not look like a fancy birthday cake but I will work on my decorating skills. Here is a picture of the cake I made for Ari when he turned six. Thanks for the vegan birthday party ideas, Angela!  Love this new addition to your blog!! !